Orchestrated by local food maven, Kim Bayer and the laughing leadership team, the Huron Valley Slow Food Local Harvest Cook Off on November 8th was a success worthy of its own haiku. 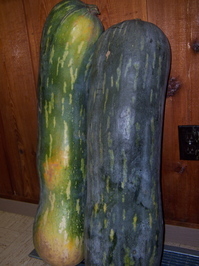 Tall squash elicit laugh Bird too as prize for food work Cook off - smiles abound. Natalie Marble (of Ann Arbor Cooks), Corbett Day (of LISD), and Alex Young (of Zingermans Roadhouse) carefully choose the shining stars of culinary creativity from a succulent schmorgesborg of tantalizing tubors and savory soups. Two and a half feet tall summer squash from Tantre Farm and free range chicken from Old Pine Farm were hoisted over shoulders and cradled in arms as prizes were given for such gastronomical goodies as Borscht, Curried Apple Golden Raisin Quinoa, Pumpkin Seed Pesto and Squash over local pasta, and pizza made from Mill Pond Bread Sourdough and toppings from the Ann Arbor Farmers Market. The judges were belly bursting and so were the rest of us. Tables groaned under the colorful weight of CSA brochures (Community Supported Agriculture shares are still available for the winter with Locavorious and Our Family Farm), the latest Slow Food campaigns (check out their school lunch initiative), and donations for Food Gatherers - all creating conversation for the tables of masticating masses. Lastly we learned about Brian Steinberg's initiative in Last One Eating to record recipes for locally sourced meals at $3-5/head! We can all support such economically engendered eagerness. Why so many rhyming pairs you ponder pensively? Kim Bayer encouraged eaters to galvanize their gray cells and write a haiku in order to win jars of jam. Poetic pairing seems to have lodged in my lobes. Check out this article on annarbor.com!